Call it our BBC pizza, and like the British (maybe), it was a bit salty. I didn’t tell my husband, but I had mentally selected the toppings before we arrived (I don’t know why, but they just randomly occurred to me). When it was time to place our order, though, he agreed to my choices. We had talked about another vegetarian pizza, but bacon seemed appealing, for some reason. You can hardly see the capers, but they’re there. 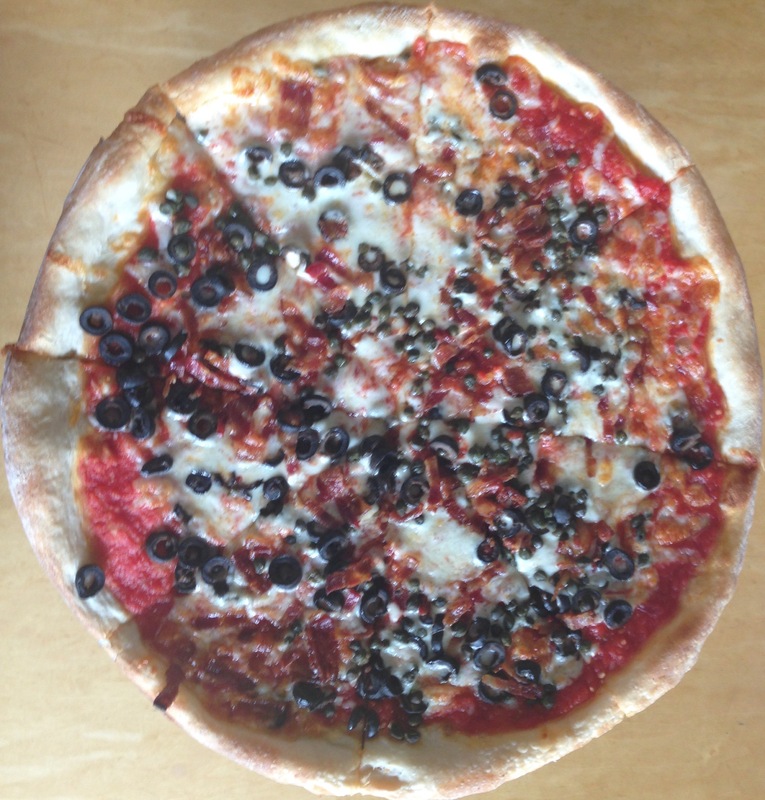 And we hadn’t had black olives in forever. The two of us had decided earlier on what film to see. We love Pixar, and I was expecting another Toy Story-like experience. I liked Inside Out a lot, and it was very clever, but was just a tad less good than Toy Story (any of them). It was funny and heartfelt, however; you may have heard that some of the characters are actually the main character’s feelings. Final verdict: entertaining, funny, and well-written. On the pizza: tasty, and unusual. Both were memorable, and evoked very good feelings.